All materials included in the price of workshop. 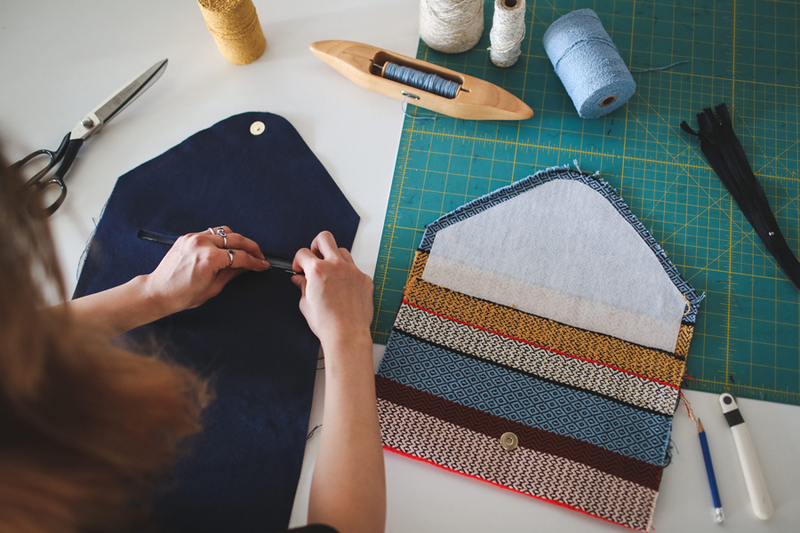 The House of Sew has teamed up with Fern’s School of Craft to bring you a two day class where you will hand weave fabric and then sew your fabric into a clutch! Spend the first day weaving at Fern’s School of Craft. Floor looms will be dressed with a black warp and ready for weaving. A variety of weft colours and fibres will be available to customize your hand woven fabric. The second day will be at The House of Sew where we will sew your fabric into a clutch. The clutch will be lined and enclosed with a magnetic snap. DISCUSSION: Weaving vocabulary, loom anatomy, basic weaving principles, how to read a weaving draft, sewing machine set up, sewing with a lining, magnetic snap, use of interfacing and hand slip stitching. NOTES: Cancellations must be made 48 hours before class date for full refund. Class subject to cancellation if the minimum registration is not met. Please arrive 5-10 minutes before class start time.